Silent fears, burning guilt, heavy sorrow often fill our hearts. We can feel that we are without hope. We might imagine that God is absent from our lives or that God has forgotten about us. In our uncertainty and vulnerability, we might cry out, "Where in the world is God?” During the Sundays after Epiphany, God’s Word has been revealing to us that God is exactly where we need him to be—in the person of Jesus Christ. This past Sunday we found God releasing us. The following devotion is adapted form Sunday's sermon on Luke 4:16-30. If you would like to read the sermon in full, simply click on Where in the World Is God? Helping You. That last one is a mask behind which we hide most often. Locked in the chains of guilt, we are captive to our sinful natures. We are hostage, though perfectly willing to be there. We know how bad things are inside of us, but we don’t want other people to know. So we simply tell those who ask how we're doing, “I’m fine,” and we hide behind the mask again. The truth is, prisoners aren’t always held behind concrete walls with watchtowers and razor wire. You and I find ourselves in prisons of our own making. Maybe you’re a captive to materialism, always trying to make comfort and stuff your goal in life. Maybe you’re more of a con man, always talking a good game, but never revealing what you’re really like at home or what you have allowed to capture your soul. You fail to see the chains and shackles wrapped around your hands or head or heart as you surf the internet for lurid images or check your bank account again to make you feel secure or pour one more to make you feel numb or find another partner to make you feel loved. You don’t realize how hard your sinful nature and Satan work to get you to cooperate with your own captivity as they separate you from God’s Word and worship. On your own, you’ll never escape. So who will rescue you from this body of death? In your captivity stands a young man who faced a room full of people who didn’t want to be free. He’s there even if you don’t realize why he’s there. Jesus is there releasing you from captivity, setting free another hostage from sin and Satan’s grasp. Consider the prophecy that he fulfilled in a Nazareth synagogue 2,000 years ago. “The Spirit of the Lord is on me, because he has anointed me to preach good news to the poor…” Isn’t that word “poor” an accurate, but unsettling description of what each of us is by nature? Regardless of where you’re at economically, every one of us is spiritually “poor” before the holy God. Before God, you have nothing to offer, except an endless list of evil you’ve done and good you’ve failed to do. Yet here comes Jesus preaching good news of forgiveness for those sins, good news of release from the guilt that holds you, good news of release from captivity. Jesus “proclaims freedom for the prisoners and recovery of sight for the blind.” He comes “to release the oppressed.”Think of yourself as a death row inmate whose time has come for execution. As you’re prepared for execution, the clock ticks down to the very moment when you are to be executed. Suddenly the phone rings. The guard notifies you that the governor has pardoned you. You’re released from the execution chamber free at last. Christ’s coming is like that governor’s pardon releasing you from certain death in hell—and what a cost for such a pardon! The prophet Isaiah described it. “He was pierced for our transgressions, he was crushed for our iniquities, the punishment that brought us peace was upon him, and by his wounds we are healed” (53:5). When Jesus lived out his perfect life of 30-some years, he went to the cross to shatter the shackles of your guilt. Jesus allowed the darkness of death to overtake him on the cross, so he could pour light into the dark blindness of your despair, to bring you peace and freedom for your soul. Sin no longer controls your life. Satan no longer oppresses you. Death no longer intimidates you. In Christ Jesus, you are free! In doing so, Jesus “proclaims the year of the Lord’s favor.”Jesus didn’t stay on that cross. He didn’t stay in the prison house of death. No, he conquered death and burst open the gates of heaven. He released you from captivity to give you real joy, a real, lasting reason to celebrate even when you face hardship or suffering or pain or loss or grief. Jesus came to make your life one great year of jubilee, of celebration, of joy in him. “Today this scripture is fulfilled in your hearing.” You have died to sin. You are now alive in Christ. You are no longer a prisoner, a hostage, a convict, or a captive. You are a new creation set free by Christ. You have true freedom in Christ, no matter what your sinful nature or Satan says. Why? “If the Son sets you free, you are free indeed!” (John 8:36) My friends, when you wonder where God is, you won’t find him in a return to your captivity. No, Jesus has released you. Christ has set you free. Now you can live in his freedom today and for all eternity. Crusaders for Life - Our quarterly meeting is planned for this Monday, February 4 @ 7 pm. Join us in the Conference Room as we discuss life issues and make plans for the spring! The Church Picnic is planned for next Sunday, February 10 @ Eastmonte Park, Cal Ripken Pavilion (830 Magnolia Drive, Altamonte Springs). Worship begins at 10 am with a potluck lunch and games to follow. If you are attending, please sign your name and an entrée on the sign-up in the entryway. The Resolution to Our Suffering – “Lord, why did you allow this to happen to me?” “How can you be a loving God and allow such atrocities to occur?” Do you know someone who is angry at God because of suffering, death, or tragedy? Have you ever asked questions like that? Martin Luther once wrote, “A theologian of glory calls evil good and good evil. 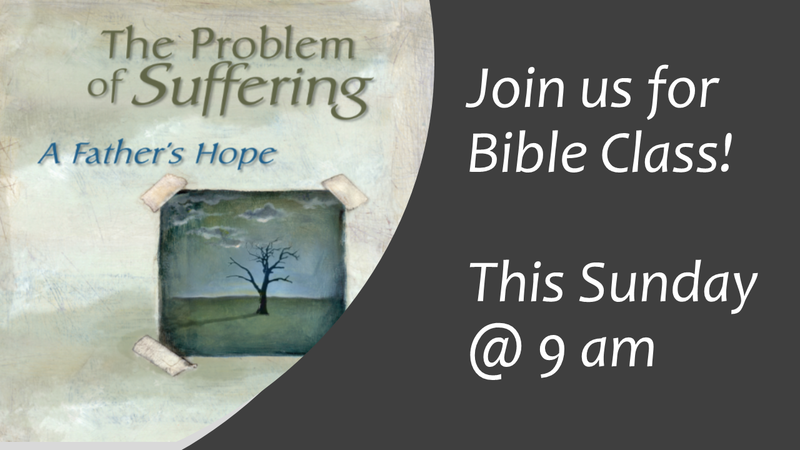 A theologian of the cross calls the thing what it actually is.” On Sundays @ 9 am, we will take a closer look at the problem of suffering—how our world addresses that problem and ultimately how God alone resolves suffering in our lives. A helpful resource we will be using is The Problem of Suffering: A Father’s Hope by Dr. Gregory Schulz (Available from Amazon and Concordia Publishing House). True and Reasonable – How do I handle objections to my faith? What can I say when people reject the Bible or Jesus or my Christian faith? In a world growing increasingly hostile to Biblical Christianity, these are questions with which we all have to wrestle. Young people today are on the front lines of this struggle facing objections to what and whom they believe. So what can we do? On Sundays @ 9 am in ACTS class, we will learn how to use a “toolbox” of basic Scriptural truths that can help us face objections to our faith. All 6th-12th graders are encouraged to attend! Midweek Bible Study has moved to Wednesdays @ 10:30 am! 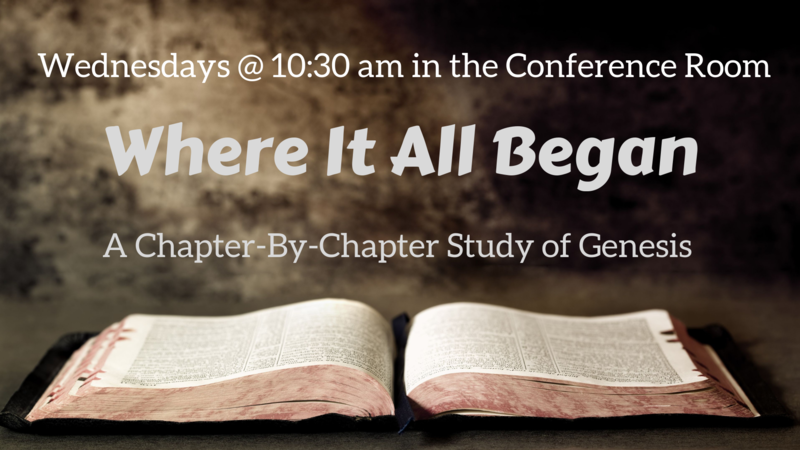 We are continuing our chapter-by-chapter study of Genesis ("Where It All Began?") and would love to have you join us in the Conference Room next Wednesday! Funday Sunday #3 is planned for Sunday, February 24. It will be a busy day full of fun activity as we focus on God's love for us! The kids will sing during worship @ 10 am. Afterwards, our KoK Science Fair will take place in the gym, while our Kindergarten Round-Up will take place in the lower grade classroom. Oh, and one more important detail! We will also have a Pig Roast prepared by our members! If you would like to help with the meal, please e-mail Dawn Todd or contact the church office! Vietnam-Hmong Outreach - The Light of the World is presenting amazing opportunities to our church body to take the gospel into Vietnam. Informational booklets can be found in the entryway. $500.000 has been raised towards these efforts. That’s about one-fourth of what is needed. If you would like to donate towards these mission efforts, please use the envelopes in the booklets or donate online @ WELS.net/Serving-Others/Missions/Asia/Vietnam. Every Member Visits - Pastor Gumm is visiting all of the members of our congregation. Please be sure to sign up for your visit on the sign-up sheet in the entryway at church. If none of the dates or times work for you or for more info, reply to this e-mail or speak with Pastor to schedule your visit! Growing in Hope – Why does it matter that Jesus is my Savior? Does the Bible really apply to my life? How can I become a member of King of Kings? We offer a Bible information course that answers those questions and many more. Classes are scheduled to accommodate your schedule. If you are interested in signing up for our next session, please reply to this e-mail!